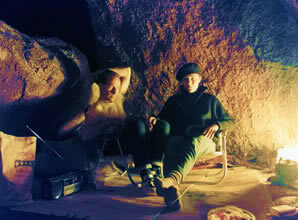 Composed and arranged by Max for the album Promised Land, based on a 1987 session in a remote desert cave in which Max played mandolin and Katie Rauh played guitar. Wren and honeybee samples from Doug Von Gausig. "A still, sunny afternoon in a remote corner of the Mojave Desert. 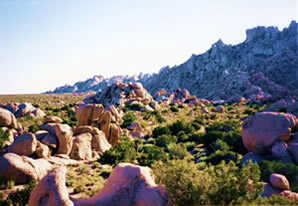 An infinite blue sky, the sound of birds and insects in a rolling valley at the foot of white granite cliffs, piles of rounded boulders taller than houses, and among them the dark green crowns of juniper trees, the yellow-green spikes of Mojave yucca, and the dense shrubbery of catclaw. In one pile of boulders, a rock shelter furnished with straw mats, chairs, a bed, a primitive kitchen." Copyright © Max Carmichael 2009, 2010.